A hilarious children’s film, SHOW DOGS, is about to hit the big screen in theaters near you! It is so amazing that will have you rolling on the floor barking! The film is out on May 18th and will be the family hit of the spring that the entire family will really fetch! 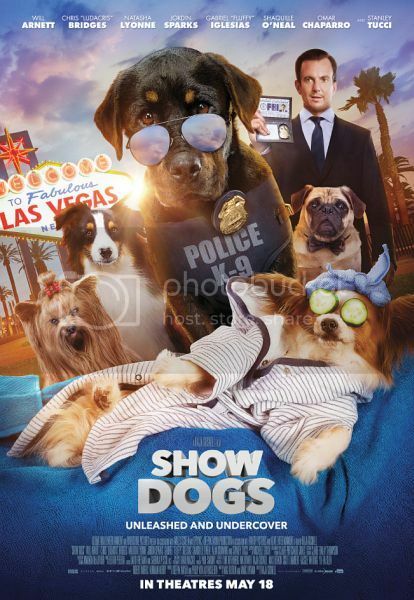 SHOW DOGS stars a charming and lovable cast of talking canine characters, including our hero Max (voiced by Chris “Ludacris” Bridges), a rugged Rottweiler NYPD police dog who plays by his own rules. Max and his human FBI partner (Will Arnett) are investigating the kidnapping of a baby panda by an underground network of illegal animal traders when they get a tip that the crime ring is planning to sell the panda at the prestigious Canini Invitational Dog Show. The uber-macho Max must undergo a makeover, with the help of a seasoned trainer (Natasha Lyonne), to go undercover and thwart the evil plot. In the hands of his new human handler Frank, Max gets in touch with his inner show dog, and learns that trusting the help of others can sometimes be more rewarding than working alone..
Watch as these two alpha dogs find themselves strangers in a land of doggie pedicures and Botox, diamond-encrusted collars and gold plated fire hydrants. The film is a hilarious throwback to the human-canine buddy comedies of years gone by and is hilarious start to finish. To celebrate the release we are excited to partner with eOneFilms Entertainment and give away some Run-of-Engagement (ROE) Passes as well as some SHOW DOGS swag. The contest is open to Canadian residents only and ends May 22, 2018. Run-of-Engagement passes are valid beginning May 21st and can be used at any Cineplex location playing the film Monday – Thursday. My granddaughter would enjoy seeing it. I would take my granddaughter or grandson if I won. They would love it. I would take my wife and two kids. All three really want to see this movie so thank you for the chance. I would love to take my kids to see Show Dogs - looks perfect for them! I would go with my four kids. I would go with my daughter :) thanks! I would take my 8 year old! He really wants to see this one! Thanks! I would take my granddaughter with me. I would take my son and daughter, they adore dogs. I would take my family. We have all been waiting or this to come out as we loved the trailers.